Want to give a friend or colleague an online course so they can level up their social media skills? 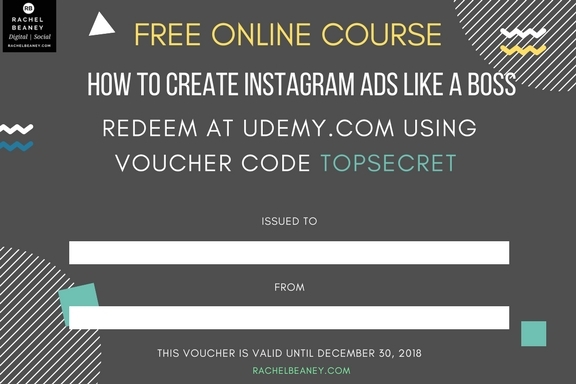 This download is a Gift Voucher, with a unique download code which the gift recipient can enter to access the online course How To Create Instagram Ads Like A Boss for free. Using the online learning platform Udemy.com, this is a go-at-your-own-pace course has plenty of hands-on activities and is loads of fun. Give it to the recipient as a PDF, or print it out and pop it in a card. This Gift Certificate gives the bearer access to the online course How To Create Instagram Ads Like A Boss. You can find out more about the course here, or more information is below. For close-up look at this product, please click here. Learn about how cost-per-click works and how to review your data for success. how to analyse your results to see if they’ve been successful. “The course is well explained, informative and I learned a lot about Instagram and ads.” – Richard V.
This course was last updated in March 2017. 1 x PDF Gift Voucher, with the access code. After you place your order you will be sent an email, with a link to download the document. It may go to your junk mail so please check carefully!